Steering - Hero MotoCorp Ltd. Check that the control cables do not interfere with the handlebar rotation. Check for smooth action & maneuverability. Park the motorcycle on its main stand and raise the front wheel off the ground. check that the handlebar rotates freely from side to side. 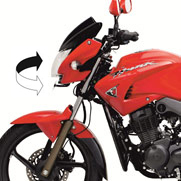 If the handlebar moves unevenly, binds, or has play, inspect and adjust the steering head bearings. Check for worn steering stem bearings by grabbing the front fork leg and attempting to move the front for side to side. Adjust/replace the bearings if any play is observed.